Piston rings in internal combustion engine seal the cylinder wall so a piston can compress the air-fuel mixture. Hence these rings are also known as compression ring or cylinder ring. If you are from engineering field, you might know in order to reduce wear and increase the life of piston grooves in high-speed engines, ferrous metal rings are inserted into the grooves. 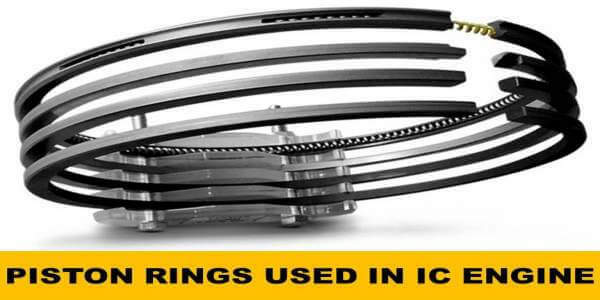 There are different types of piston rings used in internal combustion engine according to the requirement. Replacing piston rings in I. C. Engine requires some kind of expertise. Hence I will like to share information on piston rings with you. The piston rings, which are also called as comparison rings are fit closely in the grooves provided in the piston. These rings are worn out before the wearing of the piston and cylinder wall. Hence by replacing the same, you can avoid replacement of piston or cylinder. The leakage of the high-temperature gases produced during a power stroke in the combustion chamber is prevented by piston rings. These rings form an effective seal and at the same time transmit heat from crown to the cylinder walls. Hence keep the temperature within the workable limit. There should be at least two piston rings in each piston of an internal combustion engine. For the higher capacity engines, there are four or even six piston rings have been used. The number of rings is depending upon the capacity and size of the I. C. Engine. In order to achieve the effective seal against lube oil and high-pressure gases leakage, a great pressure must be exerted, by each ring on the cylinder walls. To produce this effect, the rings are made slightly larger in the diameter than that of the cylinder bore. And also cutting small gap which is partly narrowed when the ring is fitted. The end gap in the piston ring provides flexibility to the ring and the same time allowing for thermal expansion. While mounting the piston rings over the piston, a great care should be taken to ensure that the gaps of various rings should not fall in the same vertical line. The piston rings of internal combustion engines are made in various sections such as standard, tapered, grooved, wedge and L shape. Whereas oil scraper rings are made as, narrow, wide, tapered and six segment cord section. The cast iron along with 2.5% silicon will provide a good wear resistance to the piston ring. In the case of passenger cars, the piston rings are usually plated with Chromium Tin or Cadmium. The plating reduces the rate of cylinder wear and hence increases the life of internal combustion engine. There are other rings used in piston grooves, called oil scraper rings. The function of these rings is, only as much quantity of the oil as it just sufficient to maintain proper lubrication is allowed to reach the skit. The excess oil which would have leaked into the combustion chamber without serving any useful purpose and rather leading to carbonization is scraped off by the oil scraper ring.